In just four short weeks, iOS 6’s Passbook feature has totally revolutionized the life of you, me, and everybody we know. One of the marquee features of iOS 6, Passbook is Apple’s attempt to digitize many of the pieces of paper, cardboard, and plastic that pile up in our wallets and purses. But one month in, vendors have been slow to adopt the technology, and the app has yet to catch on as much as Apple might have liked. 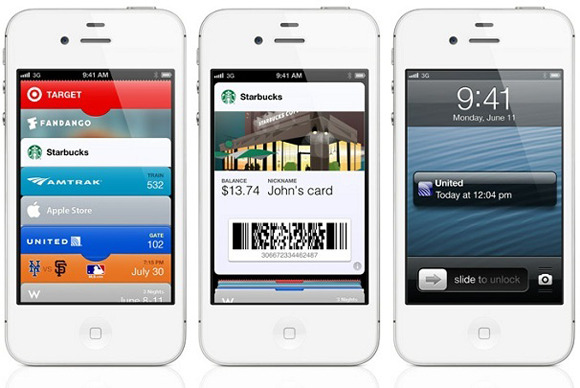 During the introduction of iOS 6 in June, Apple senior vice president of iOS software Scott Forstall described Passbook as “the simplest way to get all of your passes in one place.” All those tickets for sporting events, concerts, and movies, along with plane and train boarding passes, coupons, and store cards—they’d all have a home in Passbook. 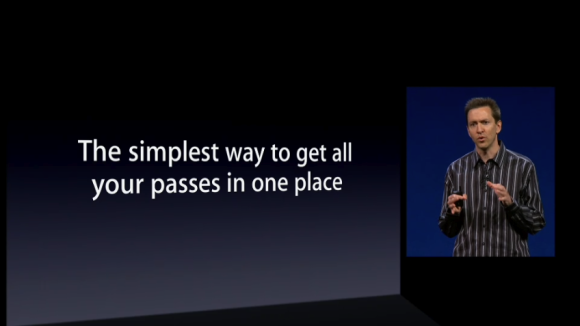 Pass is prologue: Apple executive Scott Forstall demoed Passbook in June and again in September. There were already, as Forstall pointed out, more than a few apps that offered this kind of capability. But as he said, they each had their own little fiefdom—meaning if you wanted to use one of those digitized tickets, passes, or whatever, you had to remember which app had it, dig through your home screens to find that app, and then dig through the app to find the right ticket, pass, or whatever. Passbook would, instead, put all those passes in a central location, as well as offering things like lock-screen notifications (when you approached the relevant time or location) and automatic updates of passes (in case card balances or other details, such as airline gates, change). During the keynote, Forstall showed off passes from a number of different third-party vendors, including United Airlines, Starbucks, Fandango, and Target. He summoned each by tapping on it to bring it to the foreground, where it presented a barcode, ready to be scanned. Sounds good, to be sure, but the demo on stage in June—and its rehash at the September iPhone 5 introduction—focused more heavily on the app’s aesthetics than in its moving parts. That left users—and technology writers—with a lot of questions: How, for example, does one get passes into Passbook? What if the seller doesn’t have an iOS app? Where do passes go when they’re shredded? 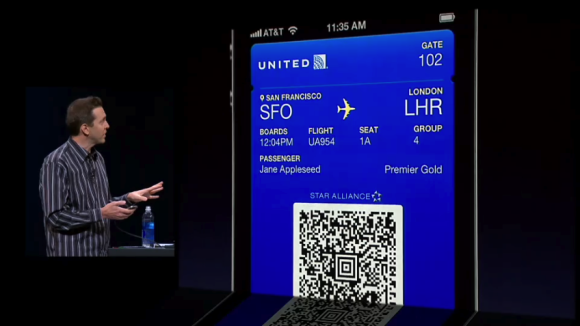 Fly the friendly skies: Forstall's demo included showing off the process for boarding passes. We anticipated that these questions might get answered when iOS 6 saw the light of day, perhaps with a high-profile announcement of partners whose Passbook-enabled apps would be in the store when iOS 6 actually launched. Instead, we got a collection of apps on the App Store, accessible via a link in Passbook (a link which is inaccessible after you add a single pass). To date, more than a month after iOS 6’s release, only 14 apps reside in the Passbook collection. That may not tell the whole story, though, since other apps like Booking.com, and services like Goldstar and Kiip have implemented support for Passbook without necessarily being featured in Apple’s collection. Other services, which wouldn’t seem at first blush to be a good fit for Passbook, have even gone ahead added somewhat more bizarre integration with Apple’s new service. As with many of the features and services Apple has touted in the past, Passbook sounded great in theory. In practice, though, Apple’s rollout of Passbook has been the quietest and most low-key since the company announced Ping—and we all know what happened to that. I’ve tried to give Passbook a fair shake in my own life, but my options are limited: I don’t fly United, American, or Lufthansa, and the Red Sox were pretty much out of the baseball season even before iOS 6 launched. I briefly considered booking a flight on Virgin Australia, but figured that might stretch even my boss’s considerably forgiving nature. Starbucks in my eyes: I put $10 on a Starbucks card to try out Passbook, mainly because it was the cheapest option available. 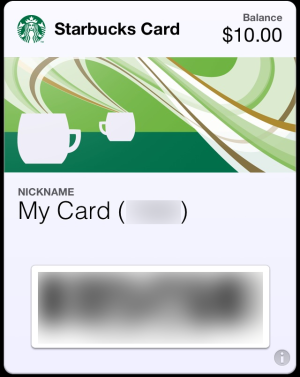 So I forged ahead and loaded $10 onto a Starbucks card when the company launched its Passbook integration. I’ve used it successfully a few times now, though the experience isn’t always as smooth as you might think. Usually the cashier has to do something with the scanner (press a button or angle it) to scan my barcode; at least they’re generally accustomed to the idea of scanning a phone, thanks to the fact that the Starbucks app for the iPhone has had a similar feature for some time. In my experience, however, I did notice that my Starbucks pass’s balance doesn’t auto-update immediately, as Apple claimed it should, even though the Automatic Updates option on the back of the card was set to On. Instead, I found that I had to go into the Starbucks app—which would update correctly—then open Passbook, flip to the back of the Starbucks card, and pull to refresh. It’s...less than smooth. At least I got a push notification that the card had been updated, so that’s something. As far as anecdotal experience goes, the aforementioned cousin told me that the ticket takers at the show she went to didn’t really understand that her ticket was on her phone, even after she explained it repeatedly. Stay on Target: The red-and-white retail chain lets you store coupons in Passbook, but the process is cumbersome. The Target app, which also now includes Passbook support, isn’t a whole lot more elegant. 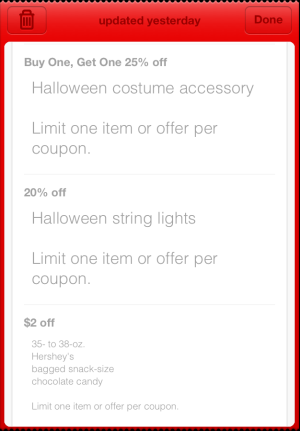 The retail chain lets you load digital coupons into the iOS app, but the process takes several steps. First you have to sign up to receive mobile coupons from within the app, which requires you to enter your name, email, and phone number. Then you get a text message, which contains a link that you have to tap to activate the mobile coupons. Finally, you’ll have to add the coupons to Passbook. That process should get easier on subsequent coupon-loadings, since you only have to register once, but the first time though, it’s a little eye-roll-inducing. Target also, oddly, bundles multiple offers on one pass. That’s convenient in terms of not cluttering up Passbook, but it’s still somewhat strange compared to the paper analogs that you dispose of after use. You can only take advantage of each offer once, but if you find yourself trying to redeem multiple offers in the same purchase you may end up having to have the pass scanned multiple times. Perhaps most perplexing is that Forstall demoed a digital version of a gift card for Apple’s own retail store, and yet a month later, the company has yet to actually roll out this capability. For such a prominent feature, you’d think the company would at least be eating its own dog food. 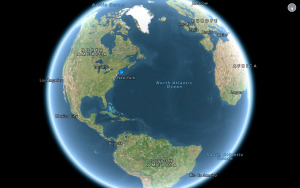 As matters currently stand, there seem to be two major sticking points for Passbook. First, third-party—and heck, first-party—support for the feature is limited. People seem to be generally intrigued by the idea of Passbook, but right now you have to search pretty hard to find a real reason to use it—I mean, I had to go to Starbucks. That situation is likely to improve over time; it can take organizations a while to adopt new technologies, especially when they’re big companies like airlines. Apple should, however, make it even easier to find supporting apps; it’d be great if Passbook continued to sport its own link to Passbook-enabled apps on the App Store, even after you started adding passes. The second issue, which is more pervasive, is the difficulty of adding passes. Passbook would seem like the natural place to go when you’re looking to add a pass. But in most cases you actually have to do so from within the company’s own app or, in some cases, from its website. It’s simple enough to use when you actually have your passes in Passbook, but the soup-to-nuts process could be smoother. As with so many other technologies that Apple has tried to reinvent and revolutionize, the biggest challenge for Passbook has been connecting it to other companies. Apple has to put some time in convincing its partners that Passbook’s features are worth adopting, or else it risks becoming just another extra app that people can’t remove from their home screens. Newsstand, anyone?